Apples of Gold Jewelry is a fine jewelry company, specializing in genuine gemstone rings, diamond engagement rings, wedding bands, personalized jewelry, Christian rings and gold cross necklaces in a variety of gold, sterling silver, platinum, and alternative metals like titanium. We look for jewelry designs that reflect unique and creative beauty that is affordable. Beginning with the premise that retail jewelry is overpriced, Apples of Gold set out to be a value jewelry company who does not compromise on quality. We never opt for low quality materials to reduce the cost of an item, but work directly with jewelry manufacturers and wholesalers to select the most unique jewelry in gold, silver, and platinum, gemstones, available in wedding bands, engagement rings, earrings, and necklaces. While we showcase a large collection of wedding bands and diamond engagement rings, gemstone jewelry, and even platinum or titanium, we don't stop with the basic staples; we search for pieces that are hard to find, one-of-a-kind and extraordinary. Our unique collection includes vintage and antique-style jewelry, black diamond rings and handmade or personalized pieces. With about 10,000 unique designs listed and new fine jewelry being added regularly in a variety of precious metals, we offer something for nearly everyone in every price-range and style. With a company name derived from the Bible, we are committed to high moral standards, unquestionable ethics and the fair treatment of all our customers and employees. Our name is derived from Proverbs 25:11: "A word fitly spoken is like apples of gold, in pictures of silver". At Apples of Gold, you will find prices that are approx. 30-40% below traditional retail for silver or gold jewelry, gemstone rings, wedding bands, and diamond rings. With our unwavering committment to value-based pricing, we believe ApplesofGold.com will be the first place you check, when shopping for jewelry online. Apples of Gold Jewelry is also proud of the fact that most of our jewelry is either made or assembled in the U.S.A. (we only purchase from with American suppliers). Of course, our gems and diamonds are mined across the globe, but our gemstones and diamonds are all set locally and the precious metals are manufactured in the U.S.A. by local, American craftsman. Coupled with our Christian values, personal and professional customer service and breathtaking fine quality jewelry, we hope you will become a loyal customer for life! 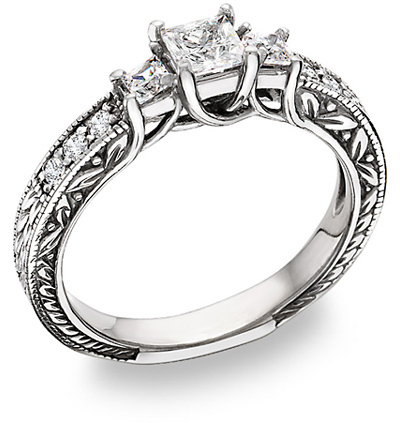 ApplesofGold.com stands behind its jewelry with a 100% Satisfaction Guarantee and an extended 45 Day Return Policy. Free shipping is also included with every order in the U.S. (international shipping is also available). Our name, Apples of Gold Jewelry, derived from the Book of Proverbs, embodies our business ethics. "A word fitly spoken is like apples of gold, in pictures of silver ..." (Proverbs 25:11).